Fred Fugen and Vince Reffet Needed Backup. We Were It. If you’re reading this article, you’ve definitely seen it: “A Door in the Sky.” In this jaw-dropping piece of short freefall cinema, we see everyone’s favorite airports bros—Soul Flyers Fred Fugen and Vince Reffet—jumping off a mountain in their wingsuits and proceeding to zip right into the door of an airplane in flight. You already know that “A Door in the Sky” is one of the most challenging, interesting and photogenic undertakings ever to happen in the airsports world. You might also know that it was an anniversary hat-tip to Patrick de Gayardon’s also-famous skydive-back-into-a-plane stunt, done 20 years ago, and that Fred and Vince wanted the Door In the Sky event to occur on the same date. What you might not know—especially since the event was a BASE jump—the key role that CYPRES played in the stunt being pulled off safely. 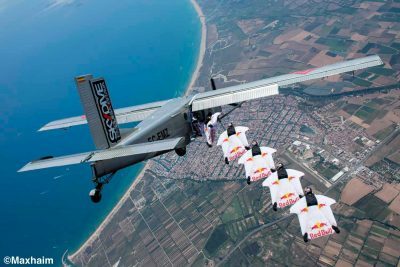 The pair goes on to explain the resultant strategy: That they would, before going to the mountain, do a bunch of training at their home base of Skydive Empuriabrava to get themselves—and the pilot—used to flying back into the plane. The need for a wingsuit CYPRES was glaringly obvious. 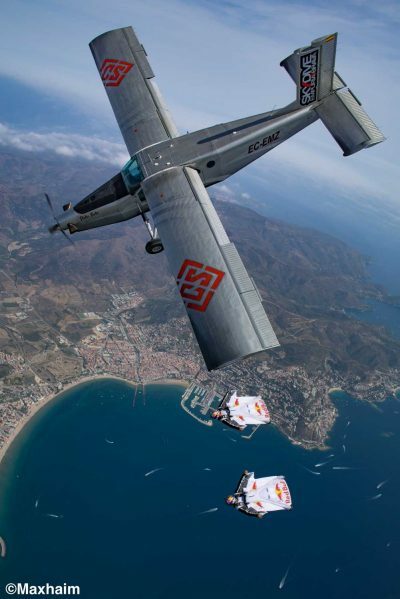 Few skydivers undertake training that has them intentionally flying at the plane with a high likelihood of at least minor impact…and that is exactly what Fred and Vince were about to do. The pair knuckled down to the task of training the stunt. 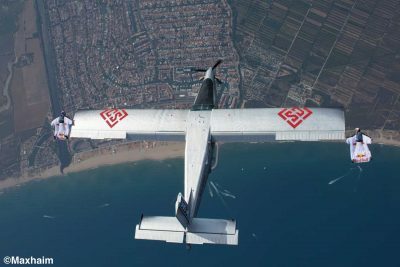 In total, they did about a hundred training flights with the plane in Empuriabrava, spending about four months of “full-on jumping,” working with their pilot and the rest of their support team. On each successive flight, they worked with their target plane’s pilot to dial in the approach. They got closer and closer, eventually doing some touches. Finally, after eighty flights, they decided together that it was time to try the re-entry. After Fred and Vince successfully flew back into the plane ten times each in the skydiving context, they knew they were ready to take it to the BASE environment. Luckily, the worst cases weren’t that bad. As it turns out, neither Fred nor Vince came anywhere close to firing their CYPRES units during training. They did, however, take various other dings and bruises, some of which left quite a mark. Even though the aircraft doorframe and interior was girded with foam, the pair took “some pretty good impacts” over the course of the training. Vince hurt his rib; Fred hurt his foot. Neither man hit his head—but neither man would have dreamed of doing the training without a CYPRES device. Fred and Vince are in the business of pulling off miracles, too—but they’re just as dedicated to process and to safety as their CYPRES supporters. 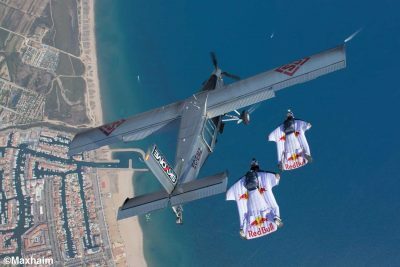 Both athletes are keen that skydivers know just how much of an arduous, painstaking process this miraculous-looking stunt has been. To that end, they have worked to obtain permission from the project sponsors to show raw training footage.